The Nutcracker Ballet is always a feast for the eyes and ears during the holiday season. Children young and old are enchanted by the festive Nutcracker costumes, the exquisite music by Tchaikovsky and a fairy tale story written by E.T.A. Hoffmann in 1816. The Nutcracker Suite, which is a famous piece of music contained within The Nutcracker Ballet, is eight pieces of music that were written and performed prior to the debut of the ballet in 1892. In more recent times, the Nutcracker Suite was used and made famous by the Walt Disney animated film "Fantasia" which, although it has been re-released, was first made in 1940. The version of The Nutcracker that most of us see today, did not come into existence until the mid 1950's in New York City when George Balanchine re-staged it. The Nutcracker Ballet, did not become a popular holiday celebration until the late 1960's. Another version of The Nutcracker was choreographed and starred Mikhail Baryshnikov and debuted in 1976. Baryshnikov's version is today the most popular TV version and the one which has sold the must video recordings. To the delight of children everywhere, The Nutcracker Ballet, is the story of a young girl named, Clara. She and her brother, Fritz, are playing on Christmas Eve when their godfather, Drosselmeyer, arrives. He is a skilled toy and clock maker. He presents two life-like dolls to the children. The dolls begin to dance around. The children begin to open their Christmas gifts and Clara's turns out to be a Nutcracker. The Nutcracker draws a great deal of attention from everyone at the party and Fritz becomes jealous. He yanks the Nutcracker away from Clara and it breaks. Drosselmeyer magically repairs the toy. While in bed, that evening, Clara has trouble sleeping as a result of her worrying about the Nutcracker. She sneaks downstairs to see him and falls asleep with him in her arms. As Midnight approaches, Clara awakens and notices she has begun to grow smaller while her Christmas tree has gotten bigger. The toys under the tree have come to life. The Mouse King is in the room with a brigade of mice. 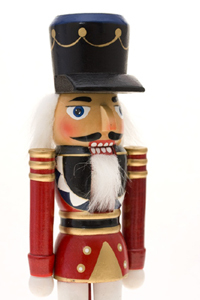 The Nutcracker awakens and leads an army of toy soldiers against the mice brigade. The soldiers are no match for the mice who quickly capture The Nutcracker and his army. In desperation, Clara decides to help and throws her slipper at the Mouse King, hitting him in the head. He falls down and his mice soldiers retreat with his lifeless body. The Nutcracker turns into a handsome Prince and leads Clara on a marvelous journey to the "Land of Snow" where they encounter Dancing Snowflakes. The Prince next takes Clara to the "Land of Sweets" where they meet "The Sugar Plum Fairy". They tell her about their battle with the mice and Mouse King. The Sugar Plum Fairy dances to reward them. After a series of dances, the Cavalier joins the Sugar Plum Fairy for a final dance. Clara finally wakes up and realizes this was all a dream. She finds herself with her favorite toy, The Nutcracker, under the Christmas tree. The Nutcracker ballet is an imaginative story and delightful for kids of all ages. It is a great piece for Musical Theater Kids to view and in which to participate. There are usually many children in these Nutcracker Ballet productions and many times they use many of the local kids. This is part of what makes them so much fun. Numerous performances of this ballet can be seen throughout the world during the holiday season. Check your local performing arts venues for times and locations. If you live too far from a city where they are performing the Nutcracker Ballet, you can still enjoy it on video. Check with your local library. In many areas, it is a tradition to air the Nutcracker Ballet on television during the holidays so check your local listings, too. In addition, there are many music recordings of Tchaikovsky's Nutcracker ballet. It is a traditional piece which can be, either in its entirety or in an exerpt on radio during the holiday season. If you want to hear the whole piece for certain, again, you can probably get a copy in your local library. Enjoy! Last year, I learned about another version of The Nutcracker. I was so excited when I heard about it that I ran right out to buy a copy of the CD. It is called "The Harlem Nutcracker". This version came about in the late 1950's when Billy Strayhorn and Duke Ellington decided to create a jazz version of The Nutcracker. They took Tchaikovsky's Nutcracker Suite and transformed it from the classical Russian style, to their American jazz style. The result was a lively version of a great work with much of the Ellington big band influence that he became known for. David Berger, a composer-arranger and band leader, decided in the 1990's to take five of the Ellington/Strayhorn themes from The Nutcracker and put them together with nine of his own. Berger stayed true to the Ellington style. This was all performed in a show entitled "The Harlem Nutcracker" which was performed by Berger and his "Sultans of Swing". This music has been recorded and is a wonderful addition to any "Nutcracker" collection. This is especially true if you are a jazz fan, like me! The Harlem Nutcracker, also has a staged dance performance that is sometimes performed during the holiday season. Don't expect, however, the classic story of Clara. This is a much more contemporary piece that contains a wide variety of dance forms and music. It is set in a Harlem Brownstone and depicts many aspects of African-American life, including the importance of religion. There is only one section that actually features some of the Ellington/Strayhorn compositions. If you are fortunate, you may be able to find it being performed in your area. Check your local performing arts venues. There is much diversity in these two "Nutcrackers", but there is beauty in both. The Harlem Nutcracker is very different from The Nutcracker Ballet. Embrace their diversity. Have some fun, get a copy of both of the versions of The Nutcracker music. Listen to each of them and try to hear the recurring themes in both pieces. It will help you to develop a better musical ear and you'll have fun in the process.